Lorinda and Greta are both board-certified music therapists, with proceeds going to Ovarian and Colon Cancer screening programs in Kentucky. An approach to using dulcimers for special populations to ensure success by use of colors, numbers, and adapted harmonic playing. A collection of tunes for playing in a nursing home or assisted living, or any facility with older adults. The songs are categorized for ease in putting together a program and arrangements are simplified for ease of playing and singing along. The cover photo was taken during a residency at Nazareth Homes in Louisville, KY.
Lorinda Jones at Norton Audubon Hospital. Patient referral for the Music Therapy Department. Nazareth Homes in Louisville, KY, Lorinda Jones, artist-in-resident. 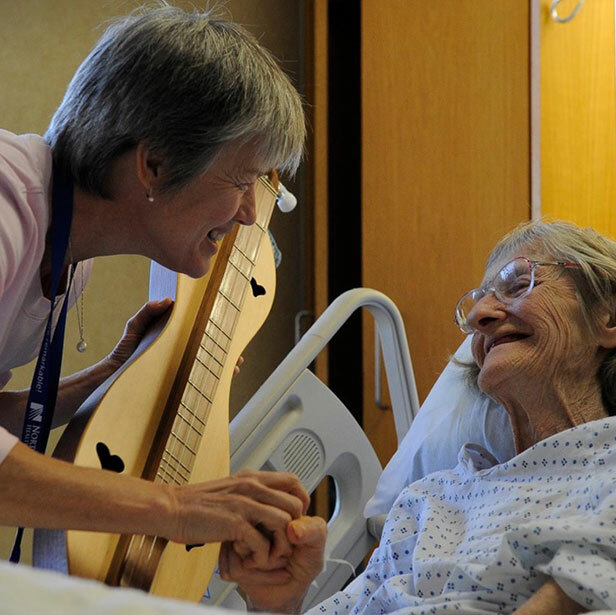 Nazareth Homes in Louisville, KY, artist-in-resident, patients playing dulcimer with adapted song material. Very Special Arts dulcimer residency, Lakewood Elementary, Elizabethtown, KY. Very Special Arts dulcimer residency, Lakewood Elementary, cardboard box dulcimer construction and instruction (Elizabethtown, KY).